Our brief was to design and install a mainly informal garden that offered colour and interest all year round. The remit also included cloaking a steep embankment to help stabilise the slope and provide interest. After the hard landscape construction had been completed we prepared a difficult site (wet Oxfordshire clay) to make it suitable for good cultivation important for the future growth of the garden. An automatic irrigation system was then installed right across the garden to aid establishment of lawns and plants. Ground preparation involved importing good quality top soil and well rotted manures to the entire site which was then cultivated by rotavator. 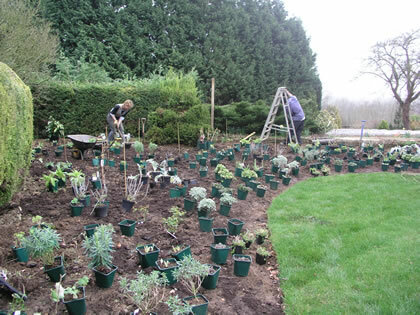 The borders were then marked out from our design ready for planting. 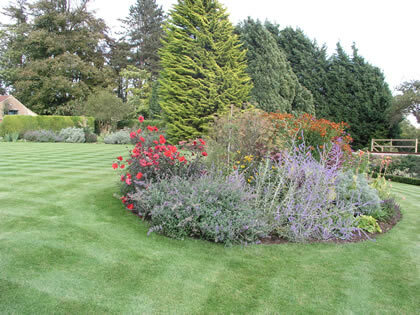 The remaining areas were the graded prior to a fine grade lawn being laid, to a standard suitable for cylinder mowing. 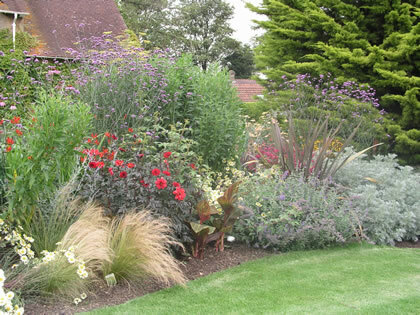 The borders were colour coordinated, a large corner bed was planted with mainly pastel colours and a large sweeping border planted with hot reds, oranges and yellows with interesting foliage in both. 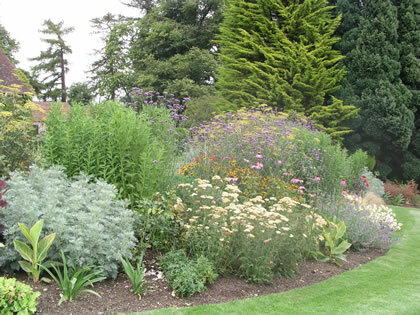 Nest to a dark yew hedge a border was planted with mainly yellow and mauve flowering plants and variegated foliage. A large amount of bulbs including narcissus, alliums, crocus and tulips were planted to extend the flowering season. Next to the main entrance of the house a small parterre was designed and planted. 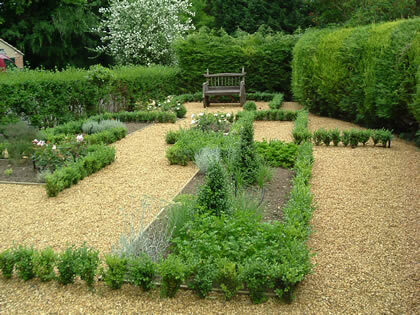 The irregular shape was spaced out with rectangular beds of different sizes, partly edged with box hedging, blocks of box and planted with herbs and New English roses for cutting. The Maintenance Rating for this garden is 8/10.